Only by shifting away from a one-size-fits-all approach to teaching and learning can every student achieve self-efficacy and true success in the classroom. In this resource, authors Eric Twadell, Mark Onuscheck, Anthony R. Reibel, and Troy Gobble provide educators with a comprehensive strategy implementation process for proficiency-based instruction. Readers will gain a clear five-step change management process for seamlessly transitioning to a new, improved model of instruction and curriculum planning in which individual student self-efficacy and growth come first. Learn the benefits of switching from traditional instruction to proficiency-based instruction (also known as evidence-based grading). Explore the process, concepts, and supporting pedagogy of proficiency-based instruction and curriculum planning. Acquire a five-step implementation strategy: (1) preparation, (2) incubation, (3) insight, (4) evaluation, and (5) elaboration. Gain change-management tools for carrying out each of the five steps as a collaborative team and onboarding all stakeholders in curriculum implementation. Discover how one collaborative team successfully worked together to implement proficiency-based instruction and plan lessons. 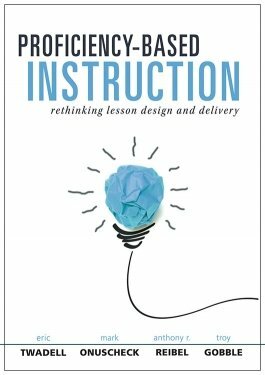 Access free, online reproducibles that will support your shift to proficiency-based instruction and lesson planning.